ATV Parts, ATV Radiator Kits, ATV Wheels Tires, ATV Suspension Springs Shocks Bumpers - Wild Boar ATV Parts > Bumpers > NEW Wild Boar Can-Am X3 Front Bumper $320.00 With Free Shipping! « NEW Wild Boar Honda Rubicon 500 2015-2018 Radiator Relocation Kit $189.00 With Free Shipping! 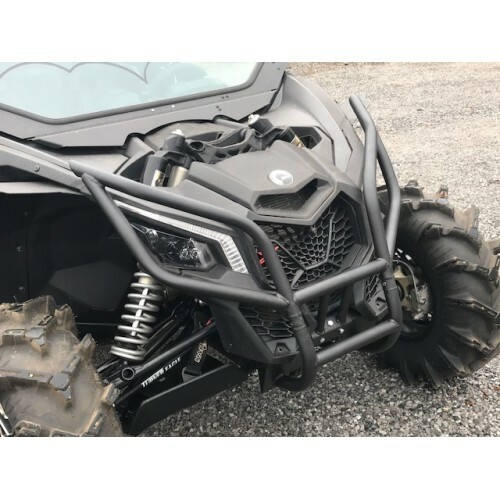 NEW Wild Boar Can-Am X3 Front Bumper $320.00 With Free Shipping! The NEW Wild Boar Can-Am X3 front bumper is re-designed to hold up to the roughest riders. The Can-Am Maverick X3 is one the most luxurious machines on the market. That’s why we designed our bumper to match the X3 in toughness and appearance. This bumper is unlike any other out there. With extra support beams you will be able to use up to a 5500 lb winch with no problem (winch plate included). CNC formed, made in the USA, and made from 10 gage steel for the extra strength to keep this beast of a machine protected. The Maverick X3 bumper comes powder coated black for extra durability and for a clean look that will have everyone turning their head.